The drive from Quartzsite to Yuma took us through the Yuma Proving Ground where nearly every weapon system in the ground combat arsenal is tested. During October - March, it is also the winter training site of the U. S. Army precision parachute team the Golden Knights. Although we weren't able to stop, we look forward to a return visit to check out the Heritage Center on base. 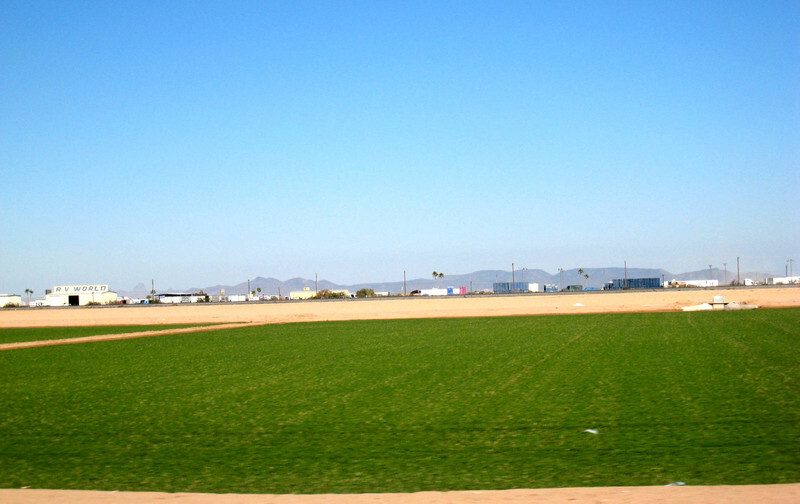 Yuma is located on the southwestern border of Arizona full of orange and lemon groves and romain and lettuce. After the desert, it was wonderful to see fields of green. However, because of the big freeze earlier this year, entire orange groves were brown and loaded with fruit ruined by the freeze. The lemons seemed to fare better. We passed this truck on the highway loaded with lemons. For some unknown reason, we were not expecting much in Yuma, but we were surprised to learn we could easily make this a winter destination. However, between the interstate noise, trains tooting at every crossing night and day...and there are a lot of them...and the inability to reserve a site for less than three months, we're not sure it would work out. We enjoyed our four days at Las Quintas Oasis RV Park with paved roads, cement pads, spacious sites separated with gravel and will stay there again...even with the train noise. Obviously, there are many people who are not as sensitive to the noise because it was a busy park, having had to spend one night dry camping in the overflow area before getting a site. We especially enjoyed our visit to the Yuma Territorial Prison along the Colorado River with California just on the other side. This well-maintained prison, now a museum, was in use from 1876-1907. One of the particularly curious things we saw at this museum was this clock with reversed numbers. It was used in Yuma's Barrel House Saloon. The numbers are reversed so that you could tell time through the mirror without having to turn around. 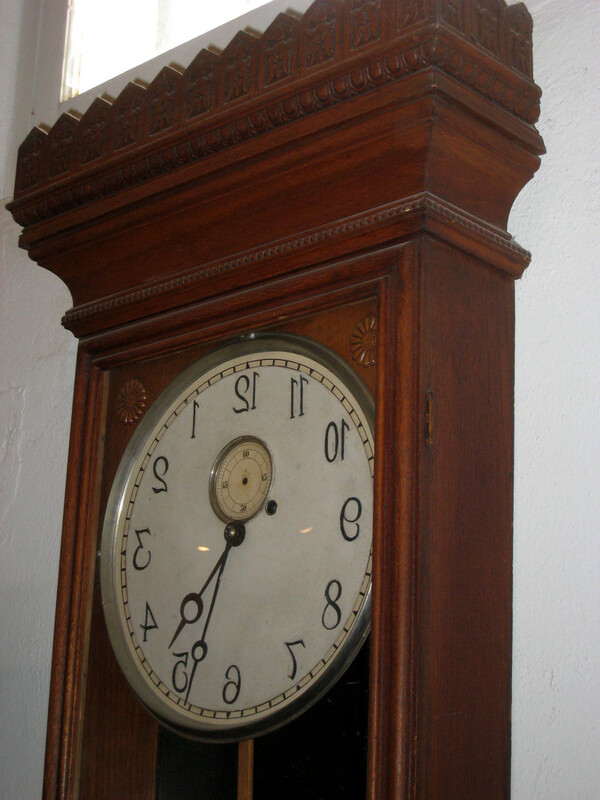 Check out the accompanying photo album for a picture of the clock in the saloon. Some western history came full circle for us when we recognized this picture of Barney Riggs. We learned about Barney when we were at the West of Pecos Museum. The Pecos museum included the original saloon with a placque on the floor marking the spot where Barney Riggs killed William Earheart in 1896. Seems Barney Riggs was serving a life sentence at the Yuma Territorial Prison for the murder of Earheart. However, he received a pardon by the governor for saving the life of the prison warden during The Gates Massacre. 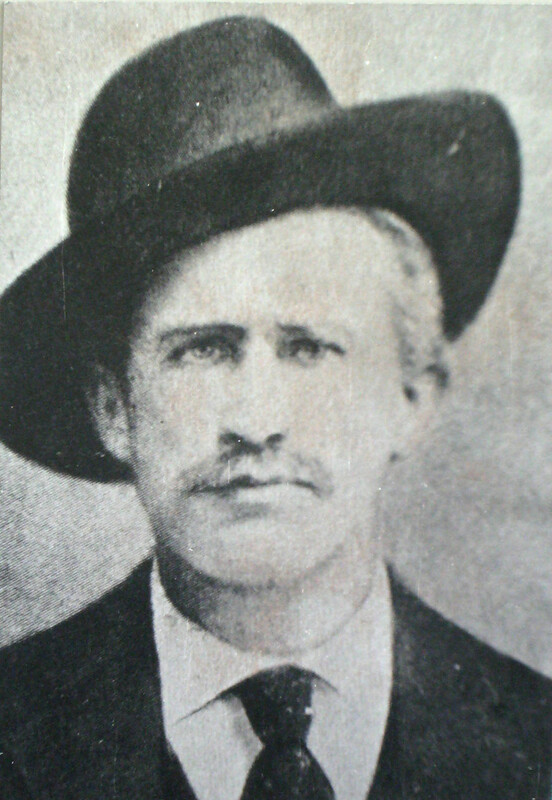 Barney Riggs was later killed in self-defense by his wife's son-in-law. Ah, life in the old west. Our next stop was El Centro, CA, landed us at Rio Bend RV & Golf Resort. These sites were also nice with gravel, cement pads, a tree on most sites separated by bushes. We had a beautiful view of the mountains with breathtaking sunrises and sunsets. El Centro is in the heart of the Imperial Valley. The Valley is an agricultural mecca where 1,400 miles of canal and 1,100 miles of pipe irrigate the desert and allow for a long growing season and a two-crop cycle. It is a major source of winter fruits and vegetables. 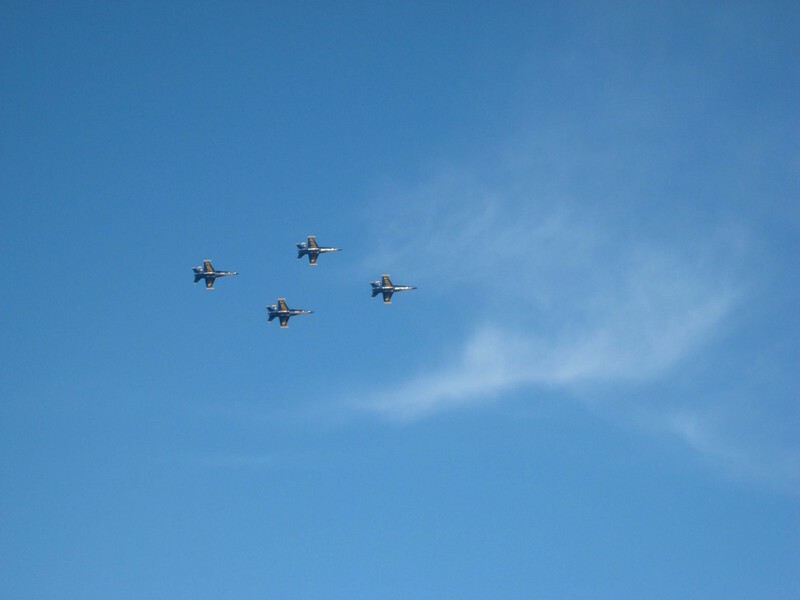 El Centro is also the winter training site for the Blue Angels so again our heart beat proud when they would fly over during their practice maneuvers. We took a day trip up to the Salton Sea and the Sonny Bono Wildlife Refuge. The Salton Sea is one of the largest inland seas and is saltier than ocean water. 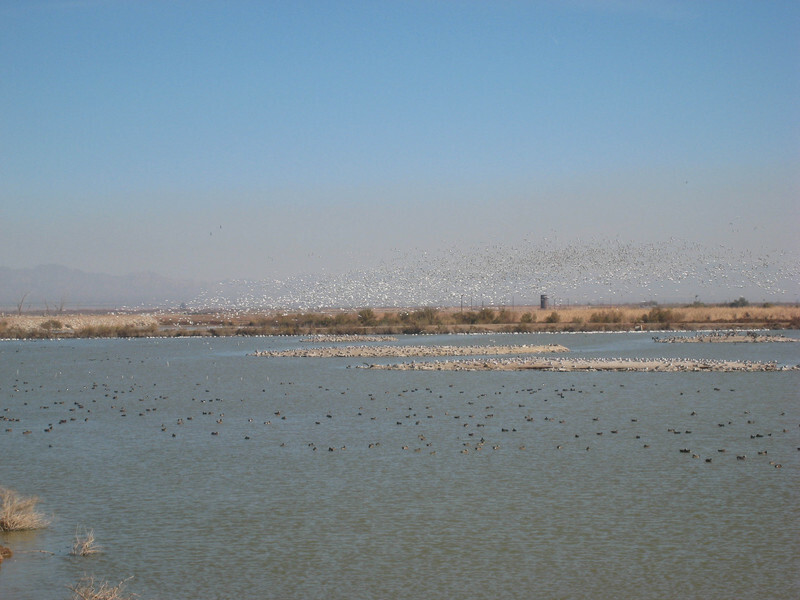 However, fertilizer runoff, increasing salinity, and inflow of highly polluted water threaten the viability of the Salton Sea for recreation as well as the avian population. The Sony Bono Salton Sea National Wildlife Refuge is the winter home of snow geese, white pelican, and pintail ducks among other waterfowl and shorebirds. There was a nice mile-long trail that took up to the base of a hill overlooking the preserve and lake. How quiet it was up there! (Check the album for more pictures.) Don't know what spooked the geese, but they flew en masse from their grazing site next to the observation ramp . On our way to the preserve we passed a plant like this with 4-5 others in the distance. After learning they were Cal-Power, we went on-line later to learn they were geothermal plants producing energy using the heat of the earth often associated with volcanic and seismically active regions. 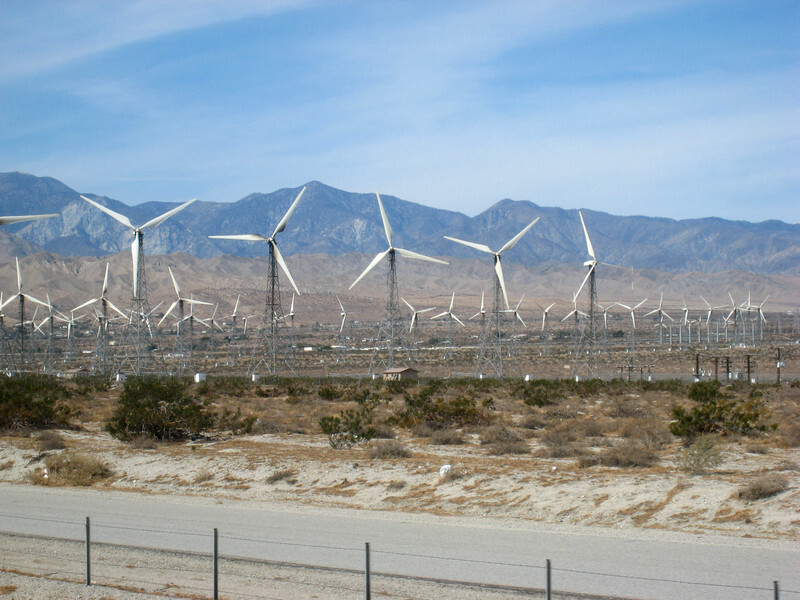 California has a number of other energy sources including these wind farms we passed on our way to Riverside. 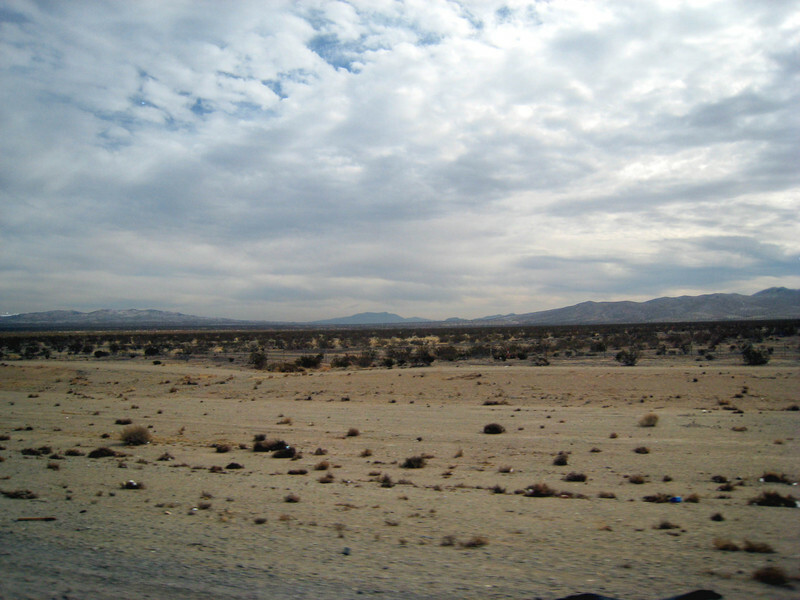 Our trip through the Morongo Valley was beautiful…I got tennis neck looking from one side of the road to the other! Surrounded by these mountains on both sides of the road, we could occasionally catch glimpses of the valley below. Morongo Valley is part of the San Andreas fault system. We were headed to Riverside to visit Swiss friends of Margery's folks. Driving the interstate sysem in California proved to be a real challenge. We quickly learned why the road system so quickly bogs down. The on and off ramps are so frequent and close together that they contribute to the congestion. Additionally, there are NO exit numbers…only road names. California has embarked on a plan to add exit numbers, but it will take several more years to complete. In all of our travels through CA, we saw only two or three exits with numbers. In the middle of this madness, we found a Riverside County Park, Rancho Jurupa (Passport America). 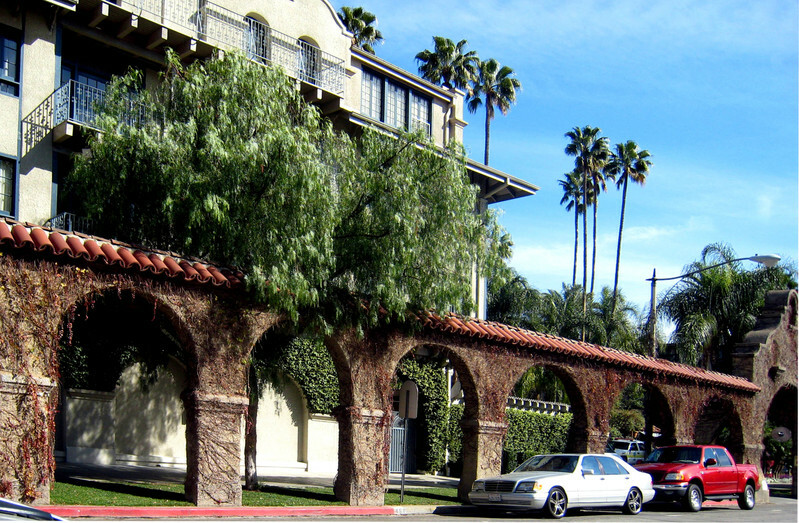 This gated park had a beautiful fishing lake, 3-point hook-ups, and shade trees throughout, We found historic downtown Riverside absolutely charming. It felt like a slice of small town America. The visit with our friends included a tour of their true California ranch home, an exploration of their garden which included lemon, lime, and orange trees ladened with fruit, and a quick swim for Molly in their swimming pool. Being unheated, it was a tad cold for her. We were surprised to learn that limes are actually yellow and lemons are more orange yellow, but both trees have thorns on their branches! We then headed east to the Mohave Desert to visit friends who formerly lived in Pittsburgh. They serve with RVICS (RVers in Christ’s Service) and are spending two months at Ironwood Camp doing construction. I’m always surprised when I see lone houses or small communities in the middle of this brown, sandy dustbowl. Ironwood Camp has a permanent staff of 40 people, and a church and Christian school on site. Over the summer, they can have 400 young people from small churches in Arizona and California. All their food is cooked from scratch, and being 4 miles back a sand road, I can only imagine how they get that amount of staples delivered. It was another opportunity to see God at work through His people. In Quartzsite, the desert was covered with rocks and stones. In contrast, the Mohave Desert is all sand and the mountains different colors. Imagine our surprise to find Twin Lakes Campground (Passport America) in the middle of the Mohave Desert owned and operated by an Oriental lady. Ahhh, the discoveries one makes when traveling. Though one lake was dry, the other was full of ducks, fish, and these geese who gave Paul a hard time. We headed back to Arizona hoping to be able to get a site Buckskin State Park, but alas arriving on a Friday it was not to be. Paul had wanted to drive up from Parker to Lake Havasau to see the sun shining on the mountains, but we’ve put that on our list for our next visit. Instead, we pushed another 2 ½ hours to get back to Tonopah, AZ, where we stayed before going to Quartzsite. The Saddle Mountain RV Park is Passport America and Good Sam with paved roads, nice-sized gravel sites, cement patios, and all hook-ups. We could easily stay here a month sometime in the future. In just the month we had been gone, we were surprised and excited to see spring arriving in the desert with a definite greening of the shrubs and trees. Note: For those of you who might have found the photos in the albums took too long to load, we have reduced their size. They load much quicker now.